519-057 The Windowing Effect in Cerebral Pattern Classification. An Application to Brain Computer Interface Technology. 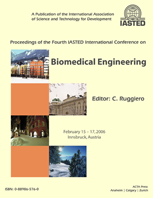 This publication covers the following topics: Molecular Bioengineering; Health Care Technology; Biomechanics and Cardiovascular, Bone, and Muscle Systems; Medical Devices, Measurement, and Instrumentation; MRI, ECG, EEG, and Segmentation; Modelling, Simulation, Systems, and Control; Medical Imaging, and Image Processing, and Signal Processing.